I recently lost my motherboard in a computer which ran CamStudio with no problems. I bought a second-hand Toshiba Satellite lap top computer, running Win7, that's about 5 years old, and downloaded CamStudio 2.7.2 (build r326). 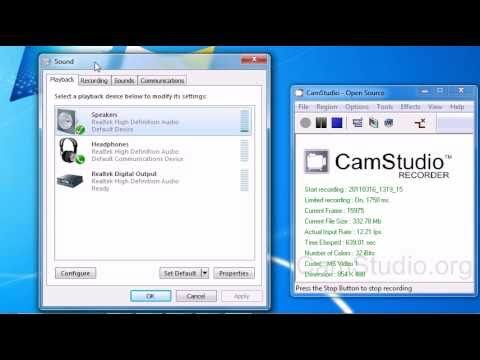 My problem is that I can't get CamStudio to record any sound with my movies. I mainly record UTube videos. I've tried using the microphone for sound, but of course that didn't work, though I tried using a patch cord between the mike and earphone outlets which I saw on the forum and which only caused feedback. I next tried 'Stereo Mix' which I saw someone use in the forum who had a 'Realtek' sound chip, but that didn't work either. Oops, I found the culprit! I changed the 'Playback through this device' from 'Default playback device' or 'Speakers' to 'Realtek Digitable Output' options. I also checked 'Listen to this device'. Glad you have it running, though!